Print your own graphene with a LightScribe DVD burner and some simple materials. Researchers at UCLA have developed a graphene manufacturing technique using a LightScribe DVD burner to create extremely thin layers of graphene which can be used to develop, among other things, super-capacitors. Folks, now this is a wicked hack. Making a bus blink a number, not wicked. Making caps where Farads are the correct unit? Seriously wicked. They're getting 2-4 mF/cm2. That's seriously impressive -- a typical electrolytic cap has a long strip capacitor that's rolled up, so you can have a lot of area in not a very large space. Don't I just need Scotch tape? Supercaps are the ultimate rechargeable battery. If you own a DVD player, say goodbye to long electric car charging times! Did this guy just invent a power storage and delivery system that doesn't explode, wear out, weigh a ton, cost a fortune or exhaust limited natural resources? That would be uh.... how we save the planet. Supercaps are amazing. Reading the commentary on hackaday (while always interesting) was enlightening. The Scotch Tape method is actually a fairly common way to make graphene sheets; I guess this is a more controlled method? By contrast, current techniques for making graphene yield small quantities of the material, fit only for experimental use. One common technique is called the "Scotch tape method," in which a piece of tape is used to peel graphene flakes off of a chunk of graphite, which is essentially a stack of graphene sheets. This results in micrometer-sized graphene fragments, which are placed between electrodes to make a transistor. At the energy densities suggested, explosion is a very real possibility, though the graphene sheets themselves may only burn. I am the Arc-Bishop of Charge. I have the capacity to turn anyone into a Friar with a simple laying-on of hands. For those keeping score at home, most of the capacitors you might encounter in the back of the ol' Crossley cathedral home theatre are measured in microFarads (1/1,000,000 of a Farad) or even picoFarads (1/1,000,000,000,000 of a Farad). I've seen milliFarad caps in huge power and RF broadcasting applications, but Farads? Wickuhpeedia has a surprisingly useful (for the layman) article on Ultracapacitors. As of 2011 [ultracaps] had a maximum working voltage of a few volts. . . and capacities of up to 5,000 farads. 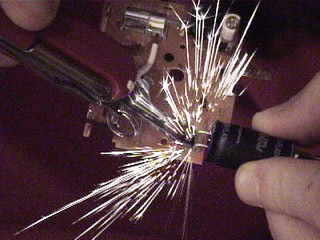 . . Prices are dropping: a 3 kF capacitor that cost US$5,000 in 2000 cost $50 in 2011. Yes, well, there is that. Suggestion: don't toss one of these things in your pocket with your keys and a lot of loose change. This is what discharging a flash capacitor (roughly 250μF) looks like. Remember, a 10MF capacitor does not mean 'Mother F*cking' capacitor, though it might as well. plinth: This is what discharging a flash capacitor (roughly 250μF) looks like. Flash capacitors are typically running around 300V. These super capacitors only work around 1V. It is really apples and oranges. eriko: Remember, a 10MF capacitor does not mean 'Mother F*cking' capacitor, though it might as well. "Want to hear a really funny joke? ", says one electrical engineer to another. "Mega-farad." The wikipedia article on capacitors is a good start. You'll see how a simple capacitor is really just two pieces of conducting materials separated by a non-conducting material. Some of the variables that determine how much energy a capacitor will store include surface area and conductivity. The higher the surface area and conductivity the more you can store. Graphene has both of these features, but is currently challenging to produce in large volumes cheaply, unlike, say, a roll of thin aluminum foil. This method apparently allows the cheap, large-scale production of very thin sheets of graphene that can be easily made into capacitors with enormous storage potential. Einstein! Where am I going to get five thousand farads?! Some good information on how capacitors are constructed today. Supercaps are the ultimate rechargeable battery. Oh, sure. But can anyone make them work at 200 centigrade? What does that mean though? That is has a sort of non-linear capacitance if you use different voltages? A 1 Farad capacitor should charge to one volt in one second, if you put one amp through it. If I'm remembering my high-school physics correctly, if you have a power source that can put out one amp at one volt, you connect either side of the capacitor to the + and - on the power source, it should charge in one second At that point, there will be a one volt difference between both sides. So, what happens if you connect it to a 10 volt difference? An ideal capacitor would charge to 1 volt in 1/10th of a second, and 10 volts in one second, right? So... what happens with these? Would they break down? Melt? Explode? Or would electrons be able to permeate the separator? Or would the capacitance rating just go down? What if you use sheets of oxidized aluminum in between the layers? Could you increase the capacity that way? What makes you think it won't explode? However, the chances of it exploding at 1V aren't as great. I mean, a regular AA battery is at one 1.5 v, and you can touch the two connectors with your finger. That means a capacitor at 1v wouldn't do much to you if you touched the connectors with your fingers. And, if you shorted it with a conductor, once the conductor started to heat up, it's resistance would go up, and with just 1v the amount of electricity going through would get cut. So maybe runaway discharges could be prevented if it's only 1v. Anyway, yeah. This is pretty interesting. I wonder if capacitors made this way would be able to be used in electric cars or something. Another cool thing: you can make transistors out of graphine, and in 2010 IBM was able to build a 100 ghz chip in the lab out of graphine using silicon CPU fabrication techniques. Anyway, how awesome would it be if you could print your own CPUs or other chips right at home with simple off the shelf equipment? Suggestion: don't toss one of these things in your pocket with your keys and a lot of loose change. And if you work with supercaps, don't employ anyone who likes practical jokes: "Here! Catch!" I use four 10 farrad capacitors something like this in my home theater. They are made for the car stereo market, and enable the car-alarm-triggering bass you sometimes hear in urban environments. Yes, that's a lot of juice in there, so I know that any distortion I may get is not due to exceeding the available power. You need amps that run on DC to use these. If you short them out, they won't exactly explode, but they could throw a screwdriver across the room with a bang. So... what happens with these? Would they break down? Melt? Explode? The dielectric breaks down and it starts looking like a short circuit. Subtly, catastrophically, depends on the circumstance--it could be any of the above. Read the article on electrolytics that b1tr0t linked, it is great. In particular, one of the primary things that makes C big is small separation between the electrodes. So adding layers doesn't really help. I mean, it helps if you need a higher volt rating, but the capacitance goes down just as fast. That's why people talk energy storage rating for capacitors. Any given volume and technology will have a fixed energy rating. You can have pretty much any combination of voltage and capacitance you want as long as it doesn't exceed the energy rating for that volume. All that said.. There seems to be a design constraint that keeps so called super capacitors in the ~1volt range, and I'm not familiar with what that is. Ultra capacitors have been around for a while. I'm mostly amazed that they got LightScribe to do something useful. ashbury: Can somebody explain in simple terms what's being done here and why it's important? Very simply, capacitors store electrical energy temporarily, and release it later. They're a lot like batteries, except for two major differences: they hold a lot less charge, and they can both store and release a charge much, much faster. This is because they actually store physical electrons in a lattice inside the cap, where batteries store power as a chemical reaction, forming and breaking bonds between atoms. Chemical energy has much greater capacity, but it's quite slow to both charge and discharge. Further, all battery chemistries wear out after maybe a thousand charges at most, while some technologies (like alkaline batteries) can only be properly charged once. And lithium-ion batteries wear out in two or three years no matter what, even if they're not being drained. Capacitors, on the other hand, can be used hundreds of thousands of times, but their big problem is that they don't store very much power. The new 'ultracapacitors' that are starting to be manufactured are using nanomolecular materials to store much larger charges than the older ones could. They still don't get very close to a battery, reaching 5 units of power per unit of weight, as opposed to 40:1 in a lead-acid battery, and as high as 250:1 in a really high-end lithium-ion battery. But they can charge and discharge super, super fast, pretty much limited only by the amount of power their leads can carry without melting. Chemical batteries are limited in how quickly they can provide power, and fast drains, fast charges, and deep discharges all tend to damage them. They're happiest if you add and subtract power slowly, and never charge all the way or (especially) discharge completely. So there's starting to be places where people can actually use an instant-charge, non-wearing, 5:1 power source, in preference to a 40:1 or 250:1 chemical source. If you've got the room, stacking up 125 units of capacitors instead of a Li-Ion battery might make sense, when you consider that the battery will last maybe three years if you baby it, and probably much less if you drain it regularly. The caps should last for decades, no matter how frequently you use them, how completely you drain them, or how long you leave them sitting without a charge in them. As that 5:1 figure comes up, and prices come down, they get more and more attractive. Oh, and then..... this link is how to make your own ultra capacitors at home, using a Lightscribe burner. You have to kind of be an electronics geek to have much interest in doing anything like that. :) There's no way anything you make yourself is going to approach what they can do in a real manufacturing facility, but it's nearly free, and fun to play with, if your mind works that way. Malor, thanks for the explanation, that was quite awesome.